A123 CEO David Vieau: "We have demonstrated our ability to strengthen our liquidity through strategic partnerships, and believe we will be successful in fulfilling any necessary funding required to continue the growth of the company." A123 Systems may be unable to raise capital and could lose contracts as a result of the battery maker's recall of defective packs sent to customers such as Fisker Automotive, a Deutsche Bank analyst said. The $55 million that A123 estimates it will cost to replace the flawed battery packs and modules "represents a severe impact" on cash reserves, wrote Dan Galves, a New York-based analyst at Deutsche Bank. "We no longer have enough confidence that AONE can raise sufficient capital (without massive equity dilution) and/or continue to augment their book of future business," Galves wrote, referring to A123's trading symbol. "Recent quality issues may lead to concerns over AONE's ability to manufacture with quality at high volumes, potentially leading to customer defections or at least difficulty in procuring new contracts." A123 said this week that it started building replacement modules for customers including Fisker and expects to begin shipping them to customers this week. The defective batteries were sent globally from A123's plant in Livonia, Michigan, the Waltham, Massachusetts-based company said in a statement. The faulty calibration of one of four welding machines at the plant caused misalignment of a component in some cells, which A123 said could lead to an electrical short and result in premature failure of the battery or decrease performance and battery life. "Initial customer response has been supportive as they recognize that we have an enabling and high-quality technology," David Vieau, A123's CEO, said in a statement. "We have demonstrated our ability to strengthen our liquidity through strategic partnerships, and believe we will be successful in fulfilling any necessary funding required to continue the growth of the company." A123 fell 13 percent at the close in New York to $1.22, the lowest closing price since the company's initial public offering in September 2009. General Motors said earlier this month it would buy A123 batteries for its electric Chevrolet Spark that use a less volatile chemistry than Chevy Volt batteries supplied by LG Chem Ltd.
A123's battery flaw caused a $107,000 Fisker Karma to shut down earlier this month in a Consumer Reports test, Vieau told reporters on a March 26 conference call. Five customers are potentially affected by the defects, he said, without naming the others. In December, shortly after the Fisker Karma went on sale, the automaker recalled 329 cars to fix battery packs made by A123 with "misaligned" hose clamps. 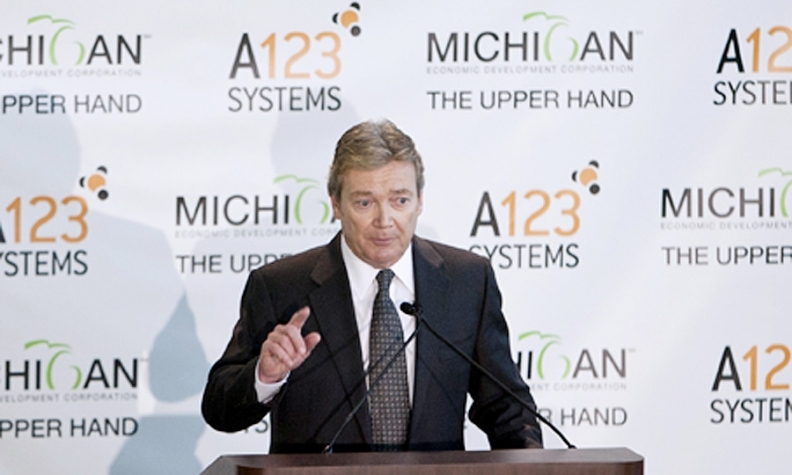 A123 projects the cost of replacing the battery systems will "require us to adjust our fund-raising strategy," Vieau said on the call, without elaborating. A123 held $187 million in cash at the end of 2011 and faced a cash burn of at least $155 million this year, Deutsche Bank's Galves wrote. The company will need to raise at least $50 million of additional capital "in the short-term," and those efforts will be "challenging" because of weak first-half results, long-term profitability concerns, pressure on battery pricing and uncertainty about electrified auto demand, he said. A123 received a $249.1 million grant from the Energy Department from a program started in February 2009 that supports the construction of U.S. plants to make batteries for hybrid and electric vehicles. The company also has a pending application for loans under an Energy Department program to support manufacturing expansion. A123 estimated in its annual report filed March 12 that it may be allowed to borrow as much as $233 million from that program.